One of my gifts to myself this year is permission to fail. Sometimes, even with a second chance, a quilting project just doesn’t work and I can’t make it work. So, the freedom to fail gives me the chance to accept that the piece didn’t work without feeling I’ve failed as a quilter. Then, once I’ve acknowledged the elephant in the room, I can figure out what went wrong and think about what I’d do differently if I could start over. Sometimes my project doesn’t work because its proportions are wrong. Sometimes the problem is poor color/value choices, lack of coherency (the vision thing), or even bad/inept technique. And then sometimes I don’t think much of the finished product, but others say they really like it. And I don’t think they have ulterior motives. Usually color doesn’t give me problems, but occasionally value trips me up. I’ve gotten better over the years at putting in some bashful colors that don’t scream look at me, but enhance the bold colors. I really, really love color. Right now I’m working on a quilt where I made a real effort to use subtle colors. I even used bone and taupe, gasp. Then there’s the coherency thing. Sometimes, especially when I’m making up an original quilt, what I’m trying to convey gets muddled. I get over exuberant and cram in too much. Unfortunately, there’s no fix for this problem except to re-purpose the top as a backing or cut it up/unsew it to use in another project. More than I’d like, what looks so wonderful on my design wall at 9 p.m. that I sew it together isn’t so great in the cold light of day. I need to remember the rule about accessorizing – after you think you’re finished, remove one item. The lesson here for me is: sleep on it. Finally, technique. There’s a reason experts recommend you practice a new technique on a sample before you use it on your “good” project. Unfortunately, what works on a small piece can go awry on a larger one. I still shudder at the mess I made of satin stitching around 2 inch circles. And I even used stabilizer. No one is going to give me prizes for my technical sewing skills, but I don’t like my quilts to evoke made by loving hands at home. What’s the good of failures? They’re great for practicing free motion quilting because I don’t worry about ruining them. They keep me humble. 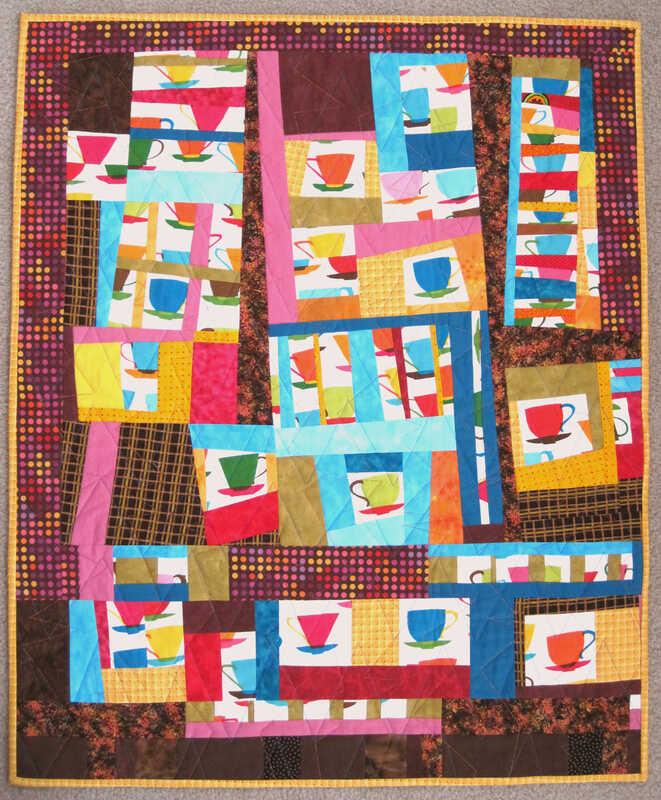 They make me think about whether the quilt has a point/mood, other than to sew a bunch of colored fabrics together. They make me analyze how I can achieve what I want. And they give me a nice supply of quilt backs.